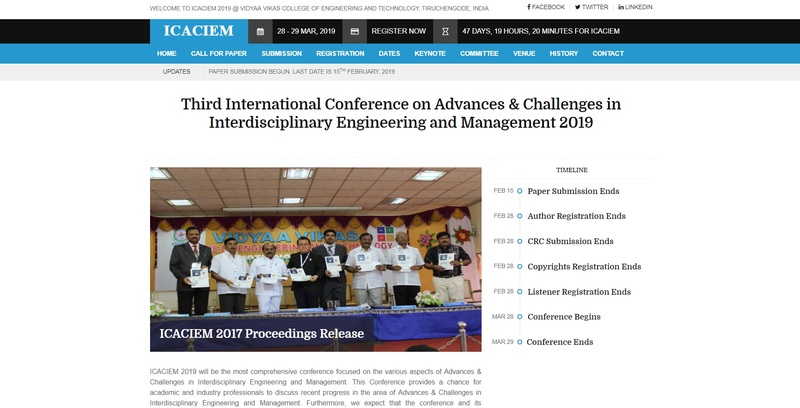 ICACIEM 2019 will be the most comprehensive conference focused on the various aspects of Advances & Challenges in Interdisciplinary Engineering and Management. This Conference provides a chance for academic and industry professionals to discuss recent progress in the area of Advances & Challenges in Interdisciplinary Engineering and Management. Furthermore, we expect that the conference and its publications will be a trigger for further related research and technology improvements in this important subject. The goal of this conference is to bring together the researchers from academia and industry as well as practitioners to share ideas, problems and solutions relating to the multifaceted aspects of Advances & Challenges in Interdisciplinary Engineering and Management.